but…. why not try something different? Ptuj Carnival (in February) is a quirky cultural experience that will leave you truely entertained. Better yet, go to Cerkno for a ski and check out their Laufarija Carnival while you are there. 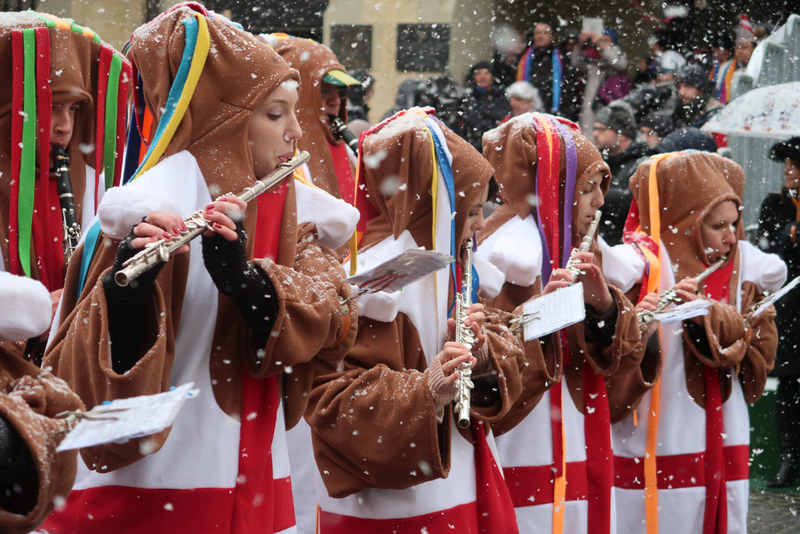 Both of these Carnivals that take place in the middle of winter are a an exciting look into the folk tales and traditions from their respective regions in Slovenia. So, where are these two little towns in Slovenia? 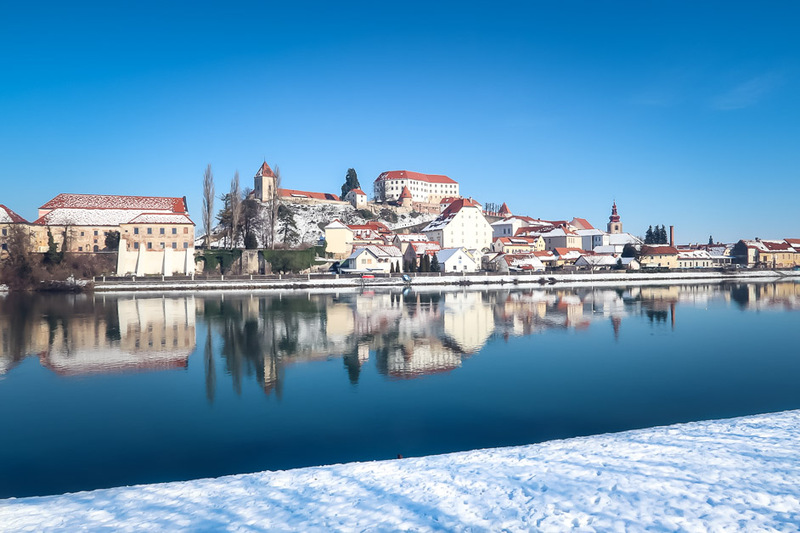 Ptuj is a gem of a town that sits quaintly on the edge of a lake Ptuj in the North East corner of Slovenia. From Ljubljana to Ptuj is 130km – 1.5 hours or 2.5 hours by train. 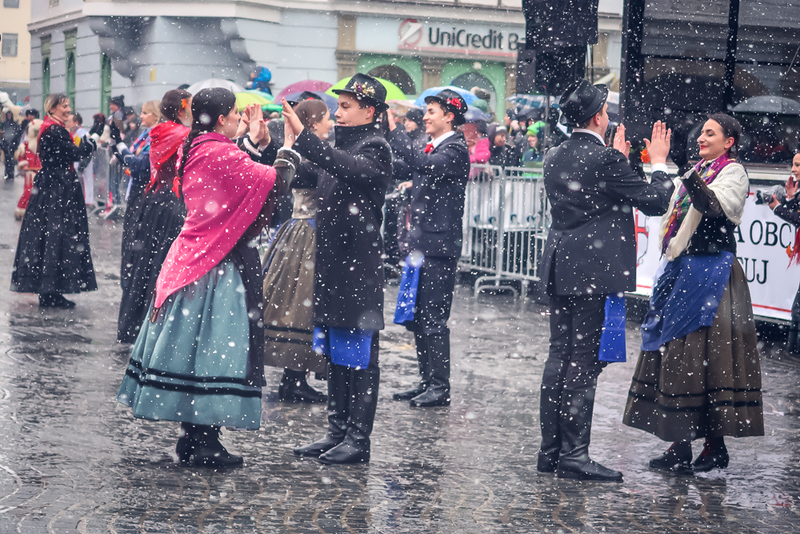 The UNESCO listed Carnival Celebrations (Kurentovanje) are held in Ptuj in February each year. Go to see the Kurent! What is the Kurent you ask? The Kurent is a mythical creature that chases winter and evil spirits away. Each February during the Shrovetide Carnival celebrations the Kurenti parade through the streets ringing the cow bell tied to their waists. Its loud, very very loud! These characters are dressed in sheepskin, head mask, green or red socks and a large stick with hedgehog spines. There are big and little Kurenti, with both young and old joining in the fun. Many costumed characters, dancers, gypsies and figures from the past also participate in the celebrations, parading down Ptuj’s main street to the sounds of whip cracking and traditional music. Sometimes the snow falls, sometimes it doesn’t, but this just adds to the atmosphere and the enjoyment you get sipping on a Mulled Wine and sampling a Pustni Krof. Kurentovanje (Ptuj Carnival) is one of the most unique experience I’ve been to! When the celebrations are over pop into Hotel Mitra to warm up your cold toes and enjoy a delightful Hot Chocolate. 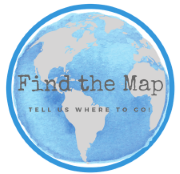 Looking for other UNESCO World Heritage Listed Sites in Europe? This little town has a history dating back to the stone age and is well known as the oldest town in Slovenia! Now that is a claim to fame. The Ptuj Castle sits high above the town with incredible views over the lake and surrounding countryside. 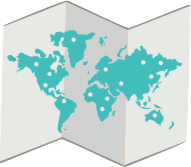 You can view all kinds of ‘archaeological, historical, cultural and ethnological collections’ at the Ormoz Regional Museum which is housed in the Castle. Ptuj Castle sitting high up on the hill overlooking the surrounding countryside. Ptuj has its very own thermal baths that you can use to relax in during the winter or summer months. Open till late, you can enjoy one of the many thermal pools, have a spa or unwind in the saunas. Home to the Dominican Order from the 13th century the Monastery has undergone a fire, multiple additions and renovations in numerous styles throughout the years. Sitting on the town walls it is truely a beautiful building both inside and out. 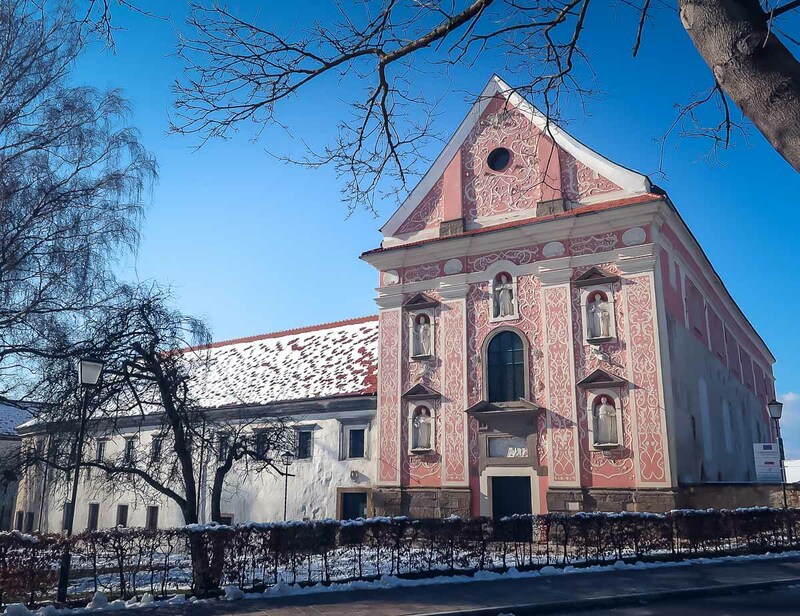 Adorned with stucco and painted in pink and white, it is a sight not to be missed. When you have taken in all that Ptuj has to offer, head West to Cerkno in the Mountains. Enjoy the Slovenian hospitality as you go and try some of the local dishes. Cerkno is a small town in the Littoral region of Slovenia, better known for its ski resort. From Ljubljana it is about an hours drive or 60.4km. However, in the snow this time can vary. 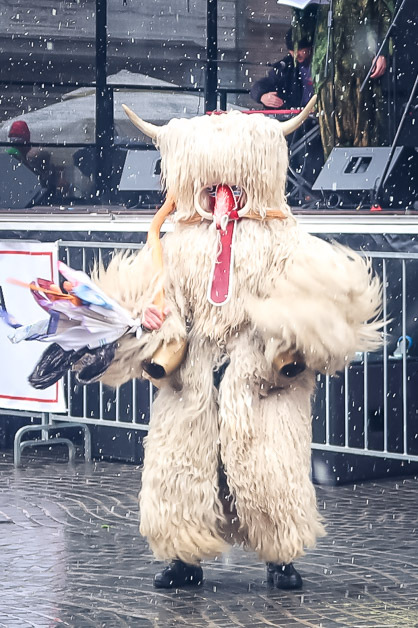 Cerkno celebrates the coming of spring with their own unique Carnival called the Laufarija. This age old tradition believed to have originated from Pagan times where the Laufarji (a multitude of costumed characters representing anything from the local town drunk to a spruce tree) are present at the trial of the Pust. The masks used in this play are UNESCO listed and quite a sight. The Pust is the personification of winter. In this interesting play the Pust stands trial before the Judge and is blamed for any local or global issue that he can be pinned on him. There are a lot of issues (sins) and the reading of his wrongs goes for about two hours. During this time the Pust escapes his captors numerous times, absconding from the stage. Unfortunately for him he is continually captured and brought back to account by the Jailers. When the reading of the crimes is complete, he is sentenced to death by a wooden hammer – hence the end of winter! It is a comical and entertaining play and should be on your must see list.